This Safety Alert highlights the need for tight control procedures when using the Siemens Maxum II Edition Gas Chromatograph. Specifically when resuming operations following a period in the maintenance mode. This Safety Alert is aimed at those using the Siemens Maxum II Edition Gas Chromatograph product which is believed to be widely in use in the Oil, Gas and Chemicals industries. The purpose of the Gas Chromatograph (GC) is to analyse samples of chemicals and determine the composition. Units can be installed both on industrial plant and lab facilities. Samples are fed into the Gas Chromatograph using carrier gases including hydrogen and nitrogen. The unit is ATEX certified for use in potentially hazardous areas. The protection concept for the upper Electronics Enclosure is “PX”. This design is based on a purge flow of air being used to dilute any flammable gases present below the flammable limits. The issue was discovered after an incident when an instrument technician was injured as a result of an explosion. The GC was being returned to service after being left in ‘hold’ status’, during this ‘hold’ period flammable gas (hydrogen) had accumulated in the electronics enclosure of the GC. The main safety feature to prevent the potential build-up of gas, an automatic purge unit, was not re-engaged as part of the start-up operation. It is possible to by-pass the automatic purge unit prior to start up by setting the GC mode from ‘operation’ to ‘maintenance’ using a key located behind the detector cabinet panel. The injuries sustained were life changing and could have been even more serious. Although the incident occurred whilst operating the Siemens Maxum II GC unit there is the possibility that a similar set of circumstances may be replicated with GC equipment from other manufacturers. The actions required are in line with duties required by health and safety law and in particular the Dangerous Substances and Explosive Atmospheres Regulations (2002) Regulation 6 and the Provision and Use of Work Equipment Regulations (1998) Regulation 12. 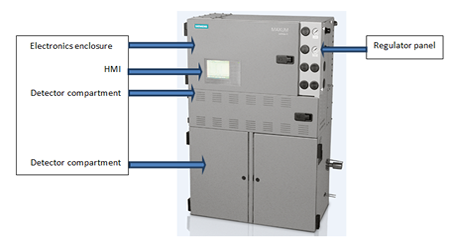 Users of Siemens Maxum Edition II GC’s should review the operation of the units, specifically the automatic purge unit control, making specific reference to the latest version of the Maxum maintenance manual edition: “PD Maxum II Maintenance Manual 10/2015 2000596-001”. Users of Siemens Maxum Edition II GC’s should discuss the suitability of their current operating arrangements for the GC’s with Siemens. Users of GC’s produced by other manufacturers should discuss the suitability of their current operating arrangements for the GC’s with the manufacturers. The designers, manufacturers and suppliers of this equipment are reminded of their duties set out by Section 6 of the Health and Safety at Work Act 1974. Please refer to the manual delivered with your device and the latest release of the safety note. If your manual is missing, please contact Siemens support. This alert sheet contains notes on good practice which are not compulsory but which you may find helpful in considering what you need to do.